Our process starts with education. If considering a commission, please read through the site and related material to ensure the best possible result. Your commission starts with a completed order form submitted with a full-resolution jpeg. We have detailed information on the site to guide you in creating the best possible reference photo for your painting. Upon receipt of your commission, our studio director in Xiamen will then choose the POC painter best suited for your project. 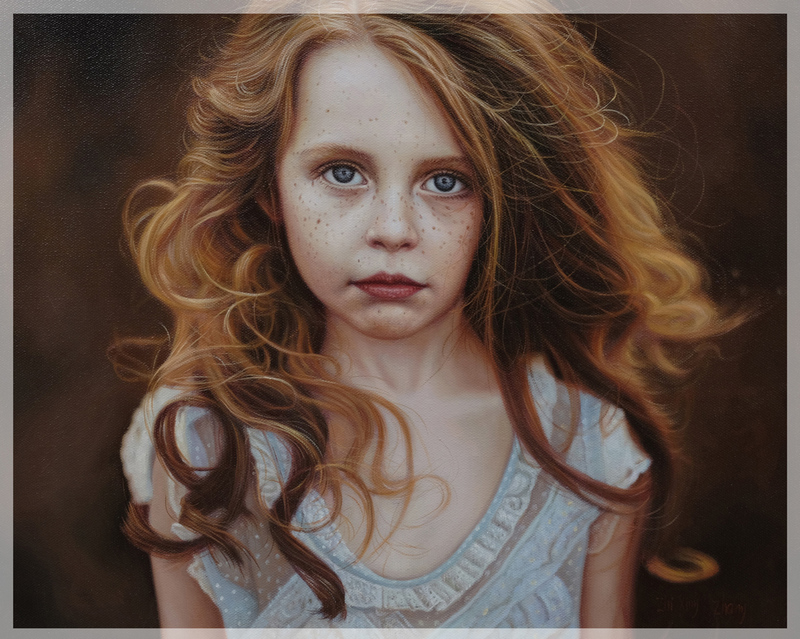 There are no photomechanical processes in our oil paintings. We hand-paint on canvas coated with gesso, a blend of white paint and a binding agent that helps oil better adhere to the canvas. The first step is a rough sketch layer, to map out the major elements in your painting for proper size, location and proportion. 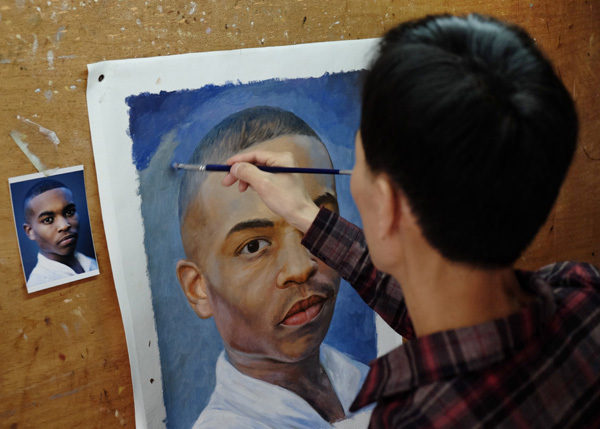 Below, POC artist George Wen works on an early layer of a portrait, the final version of which seen at right. The painter’s approach is time-consuming. But it ensures a rich, luminous result with translucent skin tones. An oil painting is not really two-dimensional. It can best be envisioned as many layers of pigment particles suspended in a transparent medium. Light reflects from all of the layers in the painting. After the optimal level of detail has been reached, a photo of your painting will be sent for your approval. This jpeg is a pale representation of the in-person painting. 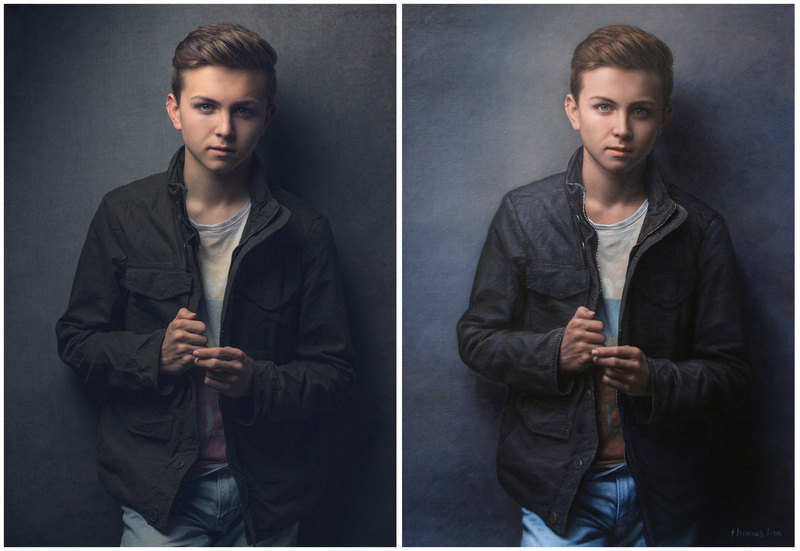 It’s not possible to capture the depth and luminance of an oil painting in a digital photo. The copy photo is primarily for judging content. If changes are required, they would be addressed at this time. If you are commissioning a painting for a third party, please include them in the approval process. Your painting will not be an exact, mechanical reproduction of your photo. It’s not like using an ICC-profiled printer; painting is a human-driven, organic process. Further, oil has a different gamut and greater depth of color than does digital photography and its various output media. As photographers, we can easily put up a gray backdrop and shoot against it. But painters blend various colors, often complementary, to build the appearance of depth and detail. For that reason, your Savage Thunder Gray® background paper might not translate well to a painting. So your painter may shift the cast to get a better result for the new medium, as seen above. Your painting is a collaborative process. 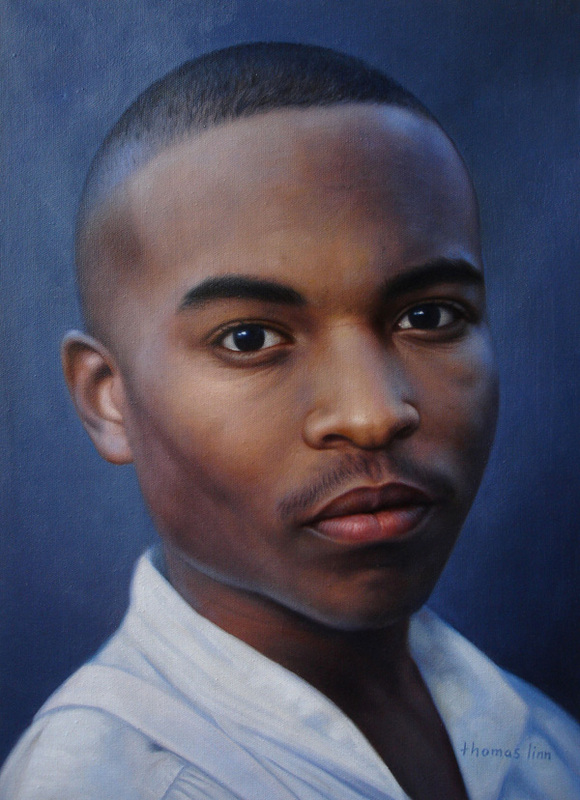 Expect some color and tonal value shifts according to the oil painter’s experience and judgment. If you have specific wishes in that regard, please let us know in advance. When you frame your painting, it will be stretched on a stretcher bar. Framing requires a small foldover at the edge, which will steal a little bit of your content. The “rabbet” (i.e., inside rail) of the frame itself then obscures a little more content. This averages a half an inch in total on each edge of your painting, and is illustrated by the light-shaded border on the painting above. Losing this half-inch rim is inconsequential if your subject has space to give around the edges. Our painters can easily extend that space to compensate for the framing process, and that’s exactly what they will do. But if you are going to crop into someone’s head you should expect the painters to extend that subject matter to compensate for the foldover and the rabbet. 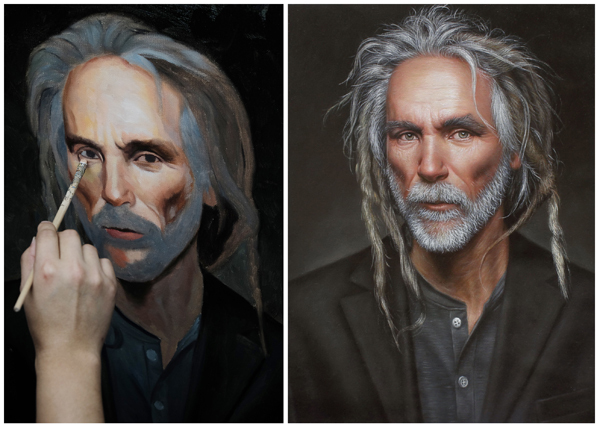 Think of it as the painter’s equivalent of Photoshop’s Content-Aware Fill tool and you won’t be far off. They are just creating something for the framing process to steal, so it will leave remaining the content you originally intended to be seen. Oil paintings typically do not incur customs duties upon import. In the rare event that they do incur a duty, that is the responsibility of the recipient. 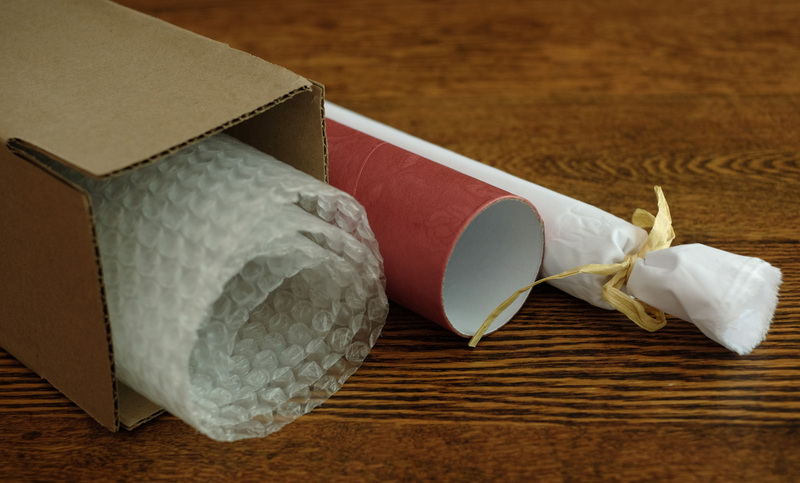 International shipments require a declaration of contents and value on the waybill. For declarations purposes, we label our paintings as “commercial painting sample” and declare a nominal commercial value (usually $200) on the waybill.